We have a once-in-a-lifetime chance to preserve and important piece of American history, the historic WWII Willow Run Bomber Plant near Ypsilanti, MI. Why Give to Save the Bomber Plant? We have a once-in-a-lifetime chance to preserve an important piece of American history — and Detroit-area history — while generating new economic development, and linking our region’s remarkable manufacturing legacy with its bright, dynamic future. 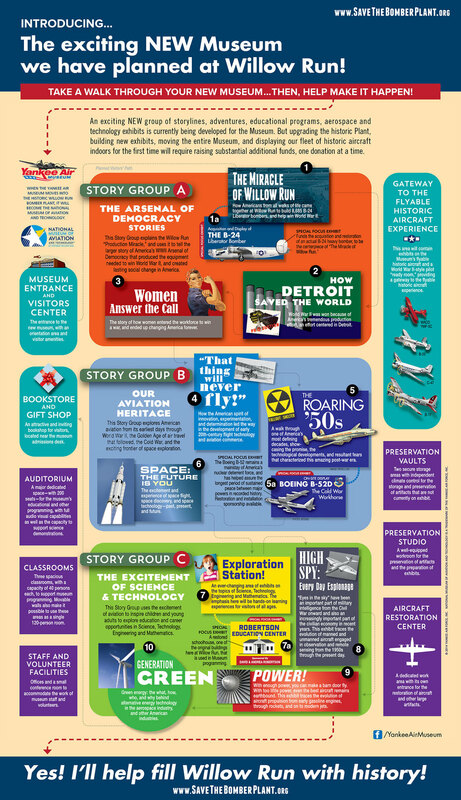 OUR EXCITING PLANNED STORYLINES FOR THE NEW MUSEUM IN THE WILLOW RUN BOMBER PLANT. In 1940, with World War II looming, many of Detroit’s most notable business leaders worked together to harness our area’s unrivaled manufacturing capacity to help prepare our nation for war. When Pearl Harbor was bombed in December 1941, the plant was already producing parts for B-24 Liberator bombers. By 1943, Willow Run was the largest manufacturing facility in the world, employing 42,000 workers, and producing a bomber every 59 minutes! The goal is to house the Yankee Air Museum’s collection of over 20 historic planes, its collections, and educational exhibits, within an expanded facility in a preserved portion of the historic Bomber Plant while showcasing the remarkable stories of the brave men and women who envisioned, designed, built, and worked at Willow Run. It is critical to reunite the Yankee Air Museum’s flyable historic aircraft with its ground-based exhibits and programs at a single site. Currently, the Museum’s exhibit spaces, collections and archives, and three 3 WWII-era flyable aircraft, are scattered among different facilities, necessitating that the flyables are not accessible to the public. Because the flyable aircraft and associated maintenance and restoration activities are the Museum’s most compelling and educational exhibits, bringing them into the new, larger Museum space at Willow Run will recreate the energy and excitement of the original (pre-2004, pre-fire) Yankee Air Museum. A new home in the Bomber Plant will also give the Museum the space to grow and realize its full potential with enough expansion space to accommodate growth for years to come. A site in the Bomber Plant supports a broader, more inclusive Museum storyline, as reflected in the future new name of the Museum, the National Museum of Aviation and Technology at Historic Willow Run. It is a unique site that, through historical interpretation, offers unsurpassed learning opportunities for children, youth and adults on the changing American workforce, initiating “just-in-time” manufacturing, and the economic and social development of this region. The Willow Run Bomber Plant was the home of the original Rosie the Riveter, Rose Will Monroe from Pulaski, KY, as well as a WWII wartime workforce of 42,000 people, as much as 30% of them women. No museum in the US today tells the full story of the WWII wartime production miracle, including the the entry of women and minority workers into the mainstream industrial workforce, and the critical role Detroit played in creating the local and nationwide “Arsenal of Democracy.” Willow Run provides the ideal setting for the Yankee Air Museum to expand its exhibit space devoted to this compelling story that triggered sweeping changes in our society. A site in the former Bomber Plant also gives the museum the space needed to fully integrate STEM – Science, Technology, Engineering and Mathematics – content into the visitor experience. The Yankee Air Museum has already begun creating new exhibits and initiating new programs that will use the excitement of flight in order to generate interest in the underlying science and technology, and inspire young people to pursue education and career opportunities in those fields. Preserving a portion of the Bomber Plant to become the new home of the museum provides an exciting first project to help stimulate new, future-oriented redevelopment at Willow Run. It will also create a compelling, large new venue for corporate, family and community events with capacity for 1,000 or more. The new facility envisioned will also build upon the Bomber Plant’s important role in our region’s World War II “Arsenal of Democracy” story to become a place at which to recognize – and promote — Michigan’s important continuing role in the aerospace industry and national defense. This is also a “green” project because it is designed to save resources and energy (not to mention money) by reusing a portion of an existing building and infrastructure at a former industrial site to create a new educational and community asset. Furthermore, the project will do this without adding “hardscape,” or otherwise contributing to this area’s storm water runoff challenges, as new construction undoubtedly would.